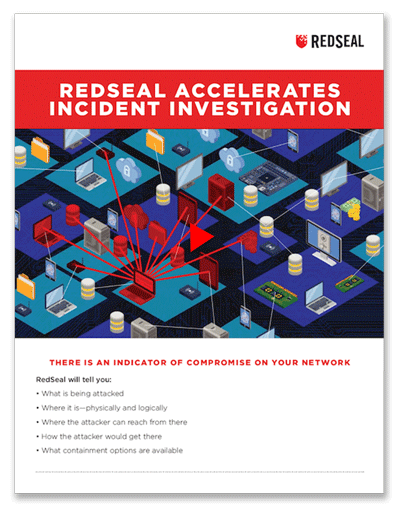 Accelerate your network incident response, investigation and containment with a RedSeal model. At the same time you must do what you can to detect and prevent network security incidents, you need to respond quickly to network attacks that do get through, quickly investigating and containing security incidents to minimize (or prevent) loss. Although SIEMs reduce a large volume of data, they still generate more indicators of compromise (IoC) than your team can quickly investigate. That follows when just locating a compromised device – physically or logically — can be a time-consuming, manual task. RedSeal’s model of your network provides detailed options. 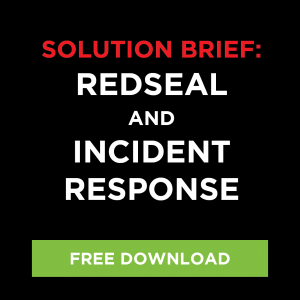 A RedSeal model of your network – across on-premise, cloud and virtual environments — gives you the detail you need to quickly accelerate network incident response. You’ll be able to quickly locate a compromised device, determine which assets bad actors can reach from there – and get information to stop them. Since RedSeal’s model includes all possible access paths, you’ll see specific paths the network attacker could take to valuable assets. And, you’ll get specific containment options so you can decide what action to take — from increasing monitoring, to placing honey pots, to changing firewall rules, to simply unplugging the device — decreasing your network incident response time. Accelerated network security incident response. Get RedSeal detailed network data directly from your IBM QRadar SIEM to speed incident investigation. RedSeal and Splunk can increase network situational awareness and full visibility of access paths to and from an IOC to critical assets and contain downstream risk. Use RedSeal to get detailed network data directly from your Micro Focus ArcSight SIEM.